Welcome ladybugs into your garden with this whimsical house for nature's polka-dotted beauties. Beetles and flies will flap to any old house, but if you really want to please a ladybug, you'll need to present her with quarters fit for a queen. Welcome your favorite polka-dotted beauties into your garden with this whimsical house that's made to host a princess properly. 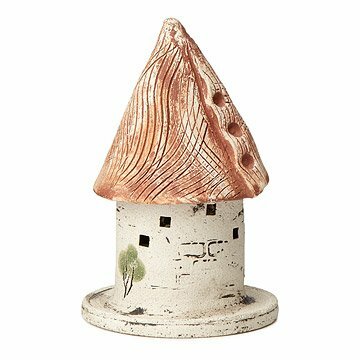 As charming as a toadstool sprouting up in a children's book, this adorable tower is hand-sculpted and painted and features tiny windows for lovely ladybugs to flutter in and out. You'll encourage these enchanting creatures to stay in your garden by providing them this safe haven where they can lay their eggs and go through metamorphosis during the coldest months. Handmade by Jo-Anne & Gerald Warren in Canada. 7" H x 4" Dia. To prevent the lid from toppling over, give it a little twist and it will become seated on the castle. To attract ladybugs: loosely fill with grass clippings, leaves, or roll the corrugated cardboard-included. Dampen slightly. Place in your garden out of direct sunlight and leave undisturbed. Aphids are Ladybugs favorite food. Position the castle near a treasured rose or veggie patch. Adorable gift for the Gardner in your life!! Gorgeous. It feels sturdy and looks like it will withstand year-round New England weather. Gave the item to a friend in hopes that it will add a little whimsy to her English garden. An adorable ornament for the garden with a purpose. This adorable castle was the perfect gift for my mother, who loves to garden and had some new space to fill. She said it was easy to set up and very attractive. Placed it near our vegetable and dahlia gardens! Love, love love this little house. It's a beautiful piece of pottery and if I didn't have a garden I'd display it inside. Unique gift for someone who spends her afternoons and evenings in the garden.